This is a Duvet Cover more than just a comforter, but looks the same on the bed. It includes the insert, which is very heavy and fits nicely. The Jacquard material is very nice and rich looking,. The only negative is that the coordinating Euro pillow covers and 2 of the accent pillows are more of a brown color than a taupe, but the design in the duvet color is spot on taupe. The specs state this is 110 x 96 but seems to fall a bit short on the lenth sideways on the bed. All in all though I am pleased and will be keeping this product. Add a touch of sophistication to your bedroom décor with the Multi Piece Sophia Comforter Set. The comforter and coordinating Euro shams feature a rich woven jacquard floral pattern in ivory and taupe. The set includes three decorative pillows that feature embroidery texture and chain stitching details. The comforter comes with a removable insert and decorative buttons for a secured fasten. Yes!! This comforter set was a home run!! The design and subtle colors was exactly what I was looking for. The duvet and liner are a nice weight. All the extra shams (both king and euro) add so many options. I like to change my bedding often, and with all the extras I can play around with many combinations. 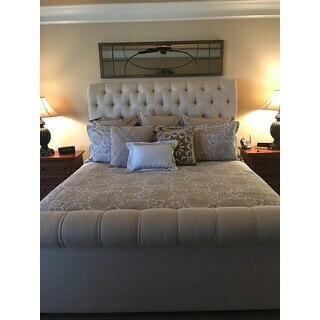 I paired this with the Hampton Hill Velvet Touch Taupe Coverlet from Overstock and the finished look is gorgeous! Excellent price too!! This bench was a great addition to our bedroom. It fits great at the foot of a king size bed. The color is very warm and neutral and easily matches with all types of furniture. The quality was great especially for the price. It was really fast and easy to assembly. I never ordered furniture online before this purchase, now I am hooked and have ordered a few more since then! Very nice set! Made well and pretty heavy. I am very happy with my purchase. I'm so happy with my comforter. I can't believe how beautiful it is. This comforter set should have cost me over $800. We love this comforter. It is very heavy I will say tho. So if you are a warm sleeper, this might not be for you. That being said, it is a duvet (so you can remove the comforter from the cover). I have only bought Madison Park sets because they last, are reasonably priced and look so elegant and expensive! If you want to spruce up your room Madison Park is the way to go! I ask love the tones in this set as it is neutral and looks gorgeous with everything. The bedding has a beautiful pattern. But we decided the jaguard feel wasn’t as comfortable as something cotton. As well the sheets and pillowcases were a bit rough. We are returning. Beautiful comforter but I phoned to ask if a bedskirt was included. They said yes but when it arrived there was no bedskirt. So glad we purchased this set! Great quality and looks fabulous! Excellent quality and beautiful. A perfect addition to my guest bedroom. Beautiful bedspread and great quality! "Which euro shams come with the queen set and what is the product name of the throw on the end of the bed." "Why dies us say it comes with an insert? Isn't it a comforter and not a duvet? Also is the king size large enough for a pillow top mattress?" This duvet is comforter style. IT comes with a removable insert. The comforter is approximately 110 inches wide x 96 inches long.